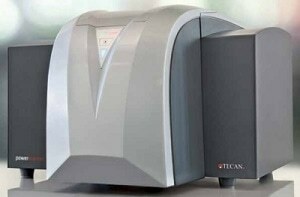 Tecan’s PowerScanner is the microarray scanner of choice for high-density DNA microarrays and protein microarrays. Its ability to correctly identify and focus on the arrayed surface of glass slides, including nitrocellulose-coated and reflective surfaces, makes it a uniquely versatile microarray scanner. The PowerScanner is available with maximum resolution of 2 or 4 micron/pixel. It is a dual channel microarray scanner fitted with powerful green and red lasers and emission filters for excitation and detection of commonly used fluorophores. The PowerScanner features state-of-the-art optics and electronic-noise cancelling for excellent sensitivity and broad dynamic range, robust slide transport and auto focusing systems for maximum reproducibility and image quality. Standard features also include an internal autoloader with capacity for up to 48 slides, air filters, and integrated calibration and performance-measuring slide, providing ideal scanning conditions and excellent performance capabilities. The highly intuitive user interface of the PowerScanner provides unprecedented flexibility for scanning a microarray slide or automatically scanning a batch of up to 48 slides, also allowing multiple scans of the same slide with different parameters. Operators can select the resolution, laser power, PMT gain, emission filter, as well as the desired image orientation and file type. Image acquisition can be followed by analysis and quantification with the powerful and flexible Array-Pro® Analyzer software.